Sum of Us features six Kansas City artists whose multimedia works explore the relationship of the part to the whole. Although markedly different in approach and process, they provide a meditation on our simultaneously whole and fragmentary states, specifically our relationships to time, space, place and self. 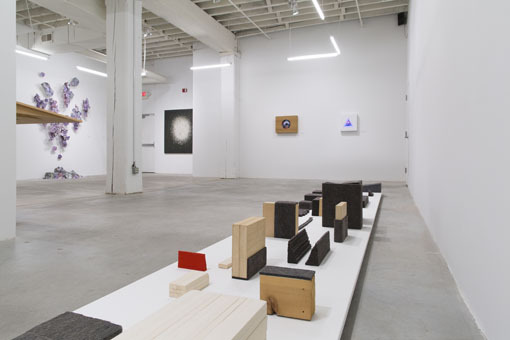 Curated by PLUG PROJECTS, a curatorial collective located in Kansas City, the exhibition features work that relies on the specter of the body as image, inspiration, absent worker or character positioning both the body of the artist and that of the spectator through relationships to scale, part and pattern. 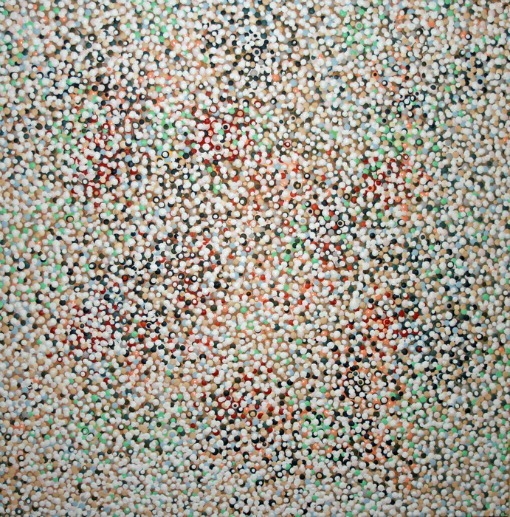 The artists in the exhibition all utilize repetition and/or meditative processes and imagery. Several, such as Miki Baird, Marcie Miller Gross and Shawn Bitters, use repetition in relation to scale. 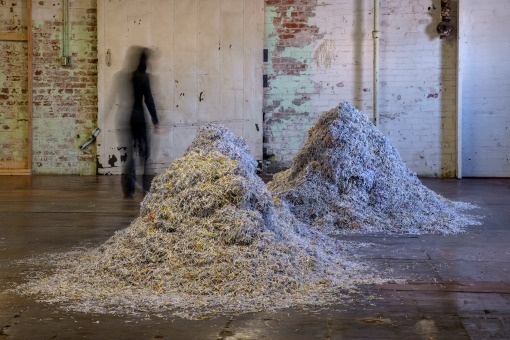 Whether in piles of shredded paper, junk mail or stacks of thick industrial felt, they build their sculptural works by repeating elements to create objects on a grand scale. Others, like Marcus Cain and Kelly John Clark, use a laborious, methodical process as well as mark making, which amass into ephemeral ghosts of people, lightly colored objects and ambiguous landscapes. In contrast, Barry Anderson uses infrared filters and animation combined with film to create kaleidoscopic distortions of the human figure, and his videos project eerily fragmented versions of children’s faces. Throughout Sum of Us, there is a spiritual and psychological exploration that manifests amidst the accumulation and shuffling of particles. Through their works and practices, all the artists provide a space for reflection on both the parts and the whole. 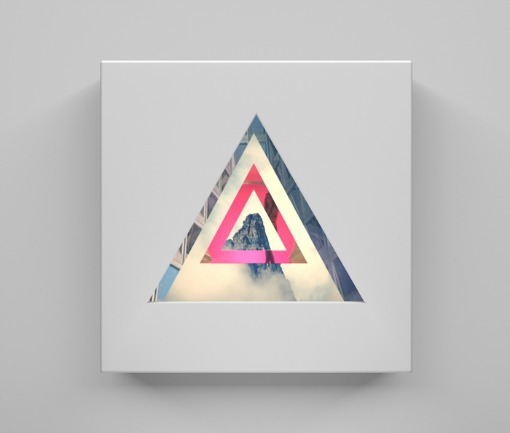 Barry Anderson works in a variety of media including video, audio, photography and sculpture, as well as across communicative forms such as exhibitions, performances, screenings and social media. In his recent body of work The Janus Restraint he employs these media to create a kaleidoscopic narrative around a character called “The Boy,” a 10-year-old who negotiates his way through rites of passage involving society, friendship and his relationship to the natural world. Anderson’s works in video art have also recently been in exhibitions in Los Angeles, Miami, San Francisco, Chicago, St. Louis and Kansas City as well as internationally in England, Finland, Dubai, Thailand, Canada and Cuba. His video animations and a monograph of his work were also featured in a large-scale city-wide project for Light Work in Syracuse, NY. His videos are in the permanent collections of the Everson Museum of Art, the Kemper Museum of Contemporary Art and the Nerman Museum of Contemporary Art. He earned his BFA in photography from the University of Texas at Austin,and an MFA in photography and digital media from Indiana University Bloomington. He is currently a Professor in Studio Art at the University of Missouri-Kansas City where he teaches courses in motion design, video art, portfolio development, and professional practices. Miki Baird tracks the ordinary unremarkable descriptors of daily life, with the act of walking comprising a vital part of her work. 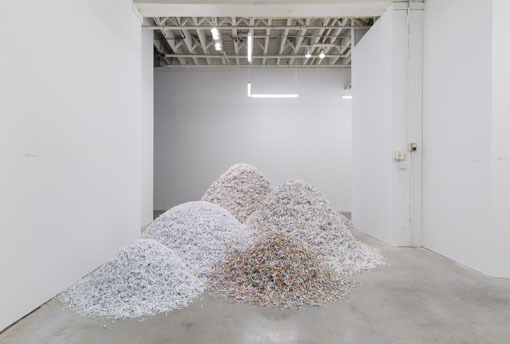 The assemblages and installations that emerge from her collections are anthologies of information accrued from presumed routine and ordinary interactional experiences. She builds them on a foundation of accumulation, deconstruction and strategic reorganization of layered imagery, with each work uniquely defined by a process rooted in repetition, color, pattern, texture and surface topography. 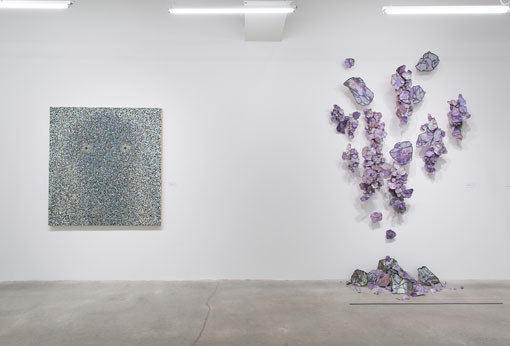 Baird has also shown her work in group exhibitions at Studios Inc, the National Women in the Arts 2012 Biennial and the Flat File Collection, Contemporary Art Museum St. Louis. She is the recipient of a 2012-2014 Studios Inc work fellowship and was awarded an ArtsKC Fund grant for Tow Lot Vanitas, Paragraph Gallery, an Urban Culture Project following residency in the Kansas City, Missouri Tow Lot Department of Neighborhood Services. The artist’s work will be on view in 2014 at Cider Gallery in Lawrence, Kansas in celebration of William Burroughs’ 100 year anniversary and in a solo exhibition at Studios Inc, Kansas City, MO. Through printmaking and papermaking, Shawn Bitters creates paper sculpture and installations that present constructed personal landscapes. Bitters uses geology and the body to discuss the present nature of the past, with physical elements becoming storytellers that present narratives and metaphors for the artist's relationship to space and place. Recent exhibitions include The Hall of Awa Japanese Handmade Paper and Museum (Yamakawa, Tokushima, Japan), Swarm Gallery (Oakland, CA), Allegra La Viola Gallery (New York, NY), International Print Center of New York (New York, NY), Naked City Gallery (Wichita, KS) and Des Lee Gallery (Washington University, St Louis, MO). The artist earned an MFA in Printmaking from the Rhode Island School of Design in Providence and a BFA in Printmaking, Brigham Young University in Provo, UT. Marcus Cain's is interested in depicting figures as portraits of energy. He attempts to capture something that isn’t necessarily seen - whether it’s a spirit, a soul, a sense of being or a chemical energy that occupies and surrounds us as well as propels us forward. The artist has exhibited nationally, and his artwork is included in such public and private collections as the Nerman Museum of Contemporary Art, the Daum Museum of Contemporary Art, BBC Worldwide America, American Century Investments, H&R Block, Sprint Corporation, Westin Hotels, Stowers Institute for Medical Research and the private collection of Designer Todd Oldham. He is a 2012 Charlotte Street Foundation Fellow, and his artwork is represented by Sherry Leedy Contemporary Art in Kansas City, MO. 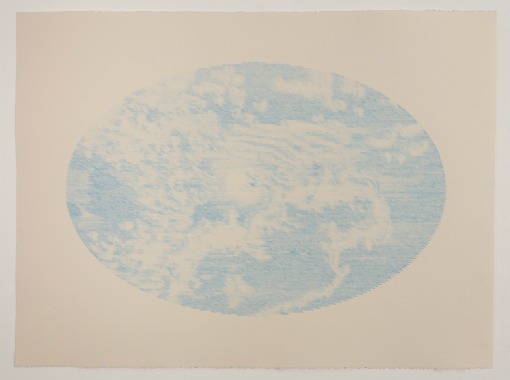 Kelly John Clark's current body of work consists of full-sheet and half-sheet colored pencil drawings taken from direct observations of natural phenomena. These include ripples on water surfaces, tonal color transitions in the night sky and the sensory confusion that occurs during moments of total darkness. Clark’s studio pursuits have also grown to include plein air oil and watercolor painting, which he does every Sunday with friends. The artist earned his Master’s Degree in Printmaking from the University of Kansas and a BFA from the University of Texas at Austin. teaches in the Printmaking Department at the Kansas City Art Institute, maintains a home-based studio practice and co-operates Field Trip Publishing, a Rocket Grant funded art-in-multiple publishing company. 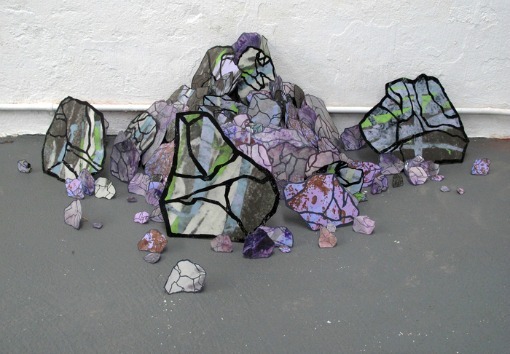 Marcie Miller Gross’s accumulative objects, installations and drawings are often site responsive and evolve from elemental, abstract forms. 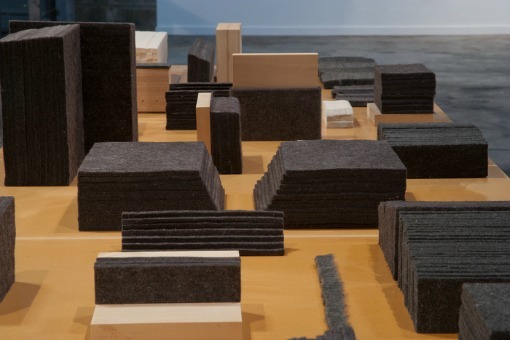 Through an incremental means of building with pliable, collected utilitarian materials, she examines the visceral relationship of mass and void, physicality and weight and the extraordinary within the ordinary. She has exhibited extensively at venues such as Kunsthal in Copenhagen, the Cranbrook Art Museum, National Museum of Women in the Arts/Epsten Gallery, Haw Contemporary, Byron Cohen Gallery and Kemper Museum of Contemporary Art and has received numerous awards and honors including, the Charlotte Street Foundation Fellowship, National Endowment for the Arts, ArtsKC Fund Inspiration Grant and Studios Inc. Residency. Her work has been reviewed in numerous publications such as Art in America, Outpost Journal, Sculpture, Art Papers, Review and Kansas City Star and is held in the collections of the American Institute of Architects/Kansas City, Daum Museum of Contemporary Art, Andrews McMeel Universal Publishing, Missouri Bank, Helix Architecture & Design, National Center for Drug Free Sport as well as in private collections in New York City, Seattle, Los Angeles, Detroit and Kansas City. She is represented by Haw Contemporary in Kansas City, MO. Barry Anderson, "Totemic Ping "
Shawn Bitters, "They Said the Stones Pile"
Kelly John Clark, "I Want to Go to Heaven But I'm Scared to Fly"
Marcie Miller Gross, "Working Parts, detail"